I've had a good session on the machine tonight - although I probably should have stopped before I'd chain sewed all three rows which will make up the block as some of the seams are a bit gung-ho. I suspect that I may regret my cavalier attitude when I come to piece the rows together to make up the blocks. I pressed the strips, then couldn't resist putting just one block together to see how it looks. Fab - I love it! 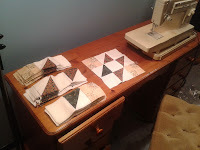 I want to hurry up and get the rest of the blocks made up so I can play QuiltSue's layout game again. I wonder how many variations of the quilt layout we can come up with? Looking good! I always have to put just one block together no matter how tired I am. The visual is important to me. I'm impatient that way too! Good for you! Your block is wonderful! Your block looks wonderful. Can't wait to see them all made and laid out. 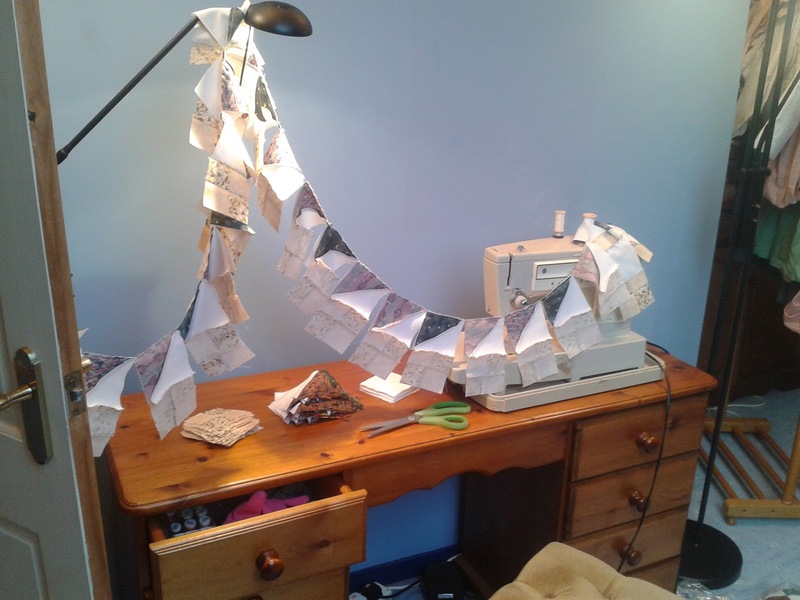 Love the banner effect on your sewing machine. Look forward to seeing what layouts you arrive at. Just have to decide HOW I want them all together now, Mrs P! To be fair, it involved little other than sitting still on a repetitive task whilst listening to the radio!